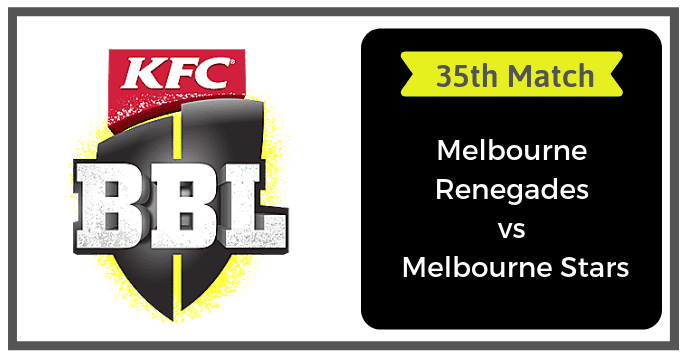 Today Match Prediction of Melbourne Renegades vs Melbourne Stars, 35th Match Preview, Playing 11, Injury updates, News and Dream11 Prediction. If you are looking for MLR vs MLS Dream11 Prediction then you are are the right place. Melbourne Renegades is all set to take on the Melbourne Stars on Saturday, January 19, 2019, at Docklands Stadium, Melbourne. If you want to know who will win then you are in the right place. In Today’s Dream11 Fantasy Cricket Match of MLR vs MLS, we will cover Pitch Report of Docklands Stadium, Melbourne, Predicted Playing 11, Toss Prediction, and Fantasy Cricket News and Tips. Who Will Win Today Between MLR vs MLS 35th Match? The Big Bash League 2018-19 is in a crucial position and most of the key players are back in the squad. Melbourne Renegades have performed well so far in this BBL but Melbourne Stars have struggled to perform. Melbourne Renegades has played 9 matches, won 5 and lost 4 matches. They are in the second position of the points table with 10 points in their pocket. MLR have won their last match against SYS. Kane Richardson was declared as the Player of The Match. Sam Harper, Tom Cooper and Mohammad Nabi are the top scorers of MLR team. They have scored 220, 154 and 140 runs so far in this BBL. Kane Richardson, Dan Christian, Cameron Boyce are the top wicket-takers. They have taken 14, 7 and 7 wickets respectively. On the other hand, Melbourne Stars have lost their last three matches back to back. They have played 8 games, won 3 and lost 5 matches. They are in the eighth position of the points table with 6 points in their pocket. Ben Dunk, Marcus Stoinis and Glenn Maxwell are the top scorers of MLS team. They have scored 163, 146 and 129 runs respectively. Dwayne Bravo, Liam Plunkett and Adam Zampa are the top-wicket-takers. They have taken 9, 6 and 5 wickets respectively. Aaron Finch, Dan Christian, Tom Cooper, Marcus Harris, Sam Harper, Mohammad Nabi, Daniel Christian and Kane Richardson are the key players of Melbourne Renegades Team. The MLR team management has announced 13-players squad. Aaron Finch and Marcus Harris have been included in the squad. Marcus Harris, Sam Harper and Aaron Finch will lead the batting department. Kane Richardson, Harry Gurney and Jack Wildermuth will lead the bowling department. Aaron Finch will replace either Mackenzie Harvey or Cameron White in the playing 11. Playing chances of Cameron White is more. Batsmen: Marcus Harris, Aaron Finch, Tom Cooper, Cameron White/Mackenzie Harvey. All-Rounders: Daniel Christian, Mohammad Nabi. Bowlers: Harry Gurney, Kane Richardson, Jack Wildermuth, Cameron Boyce. Aaron Finch (Captain), Dan Christian, Harry Gurney, Mackenzie Harvey, Joe Mennie, Kane Richardson, Jack Wildermuth, Cameron Boyce, Tom Cooper, Marcus Harris, Sam Harper, Mohammad Nabi, Cameron White. Glenn Maxwell, Dwayne Bravo, Ben Dunk, Evan Gulbis, Peter Handscomb, Liam Plunkett and Marcus Stoinis are the key players of Melbourne Stars Team. The MLS team management has announced 13-players squad. They have made four changes in their squad. Peter Handscomb, Glenn Maxwell, Adam Zampa and Marcus Stoinis have been included in the squad. They have replaced Liam Bowe, Nick Larkin, Scott Boland and Jonathan Merlo. All the four players included in the squad will play today’s match. Peter Handscomb will replace Seb Gotch, Marcus Stoinis will replace Nick Larkin, Glenn Maxwell will replace Jonathan Merlo and Adam Zampa will replace Liam Bowe in the playing 11. Ben Dunk, Marcus Stoinis and Peter Handscomb will lead the batting department. Liam Plunkett, Jackson Bird and Adam Zampa will lead the bowling department. Marcus Stoinis is one of the most valuable players of Melbourne Stars. Batsmen: Nic Maddinson, Ben Dunk, Evan Gulbis, Glenn Maxwell. All-Rounders: Dwayne Bravo, Marcus Stoinis. Bowlers: Liam Plunkett, Tom O Connell, Jackson Bird, Adam Zampa. Glenn Maxwell (C), Dwayne Bravo, Seb Gotch, Peter Handscomb, Lance Morris, Liam Plunkett, Adam Zampa, Jackson Bird, Ben Dunk, Evan Gulbis, Tom O’Connell, Nic Maddinson, Marcus Stoinis. Fantasy Cricket Pro Tips: The above players are most likely to perform today. You can take them as a captain and vice-captain in your Dream 11 teams. You can also take a captain from playing 11. Note: Try to play small leagues if you want to win every match. The last time when Melbourne Stars faced Melbourne Renegades, MLS has defeated MLR by 7 wickets. If we look at the statistics of the last five matches between MR vs MS, MR has won two matches whereas MS has won three games. According to crix11 astrology prediction, MLS will win the match today. The team winning the toss should opt to bowl first as batting in the first inning can be a difficult task as the seamers may get some additional help from the wicket. According to crix11 astrology prediction, MLS will win the toss and ask MLR to bat first. The match will be played on Saturday, January 19, 2019. Match Big Bash League 2018-19, MLR vs MLS, 35th Match. Time 07:45 AM GMT, 01:15 PM IST, 06:45 PM LOCAL. The Docklands Stadium has a track record of assisting the fast bowlers. If we look at the last three matches played on this ground, batting was extremely difficult and the bowlers have benefited especially the fast bowlers. It is expected that the wicket will favour the bowlers in the 35th match also. Dream11 Fantasy Cricket Tips: Try to take middle-order batsmen and fast bowlers in your Dream 11 teams. The weather of Melbourne is forecasted to be partly cloudy in the morning followed by sunny in the afternoon. The sky will be clear and there is no sign of rain today. A hot and humid day is predicted. The temperature is expected to be 20-Degree Celsius and the humidity to be 54%, which may go up to 76%. Fantasy Cricket Expert Tips: The weather condition will favour the seamers. MLR vs MLS Dream11 Tip of the Match: Try to take three quality batsmen, three all-rounders and four fast bowlers in you Fantasy Cricket Teams. This is it for Today’s MLR vs MLS Dream11 Fantasy Cricket Match Prediction of 35th Match. Read the complete post and win in any fantasy cricket league. Leave a comment below and share the post so that others can also find Crix11 which is the best fantasy cricket prediction site. Don’t forget all the information on this website is absolutely free and if you utilize the data correctly your winning chances is 100% sure.